What Flooring Surfaces Are noblechairs Suited For? Thanks to the polyurethane coating of the swivel casters, noblechairs are equally suited for hard floors (laminate, parquet, cork, screed, wooden floorboards, wooden tiles, stone, granite, linoleum, ceramic tiles) and soft floors (carpets, mats, rugs, pelts). In order to shield particularly sensitive surfaces from abrasion, we recommend using a floor protector. How Much Weight Can They Withstand? EPIC seats are approved for a weight of up to 120kg, while ICON and HERO seats are approved for a weight of up to 150kg. Weight should be centered in the middle of the seat in order to stress the casters evenly. How Do I Clean My Chair? Coverings are very easy to clean, regardless of which material you choose. By using a microfibre cloth and a little water, stains and dirt can be removed quickly. For more serious soiling from substances such as ink, rubbing alcohol should be used. In order to increase the longevity of your gaming chair, a good real leather / imitation leather conditioner should be applied weekly – this helps protect the material from cracking, wear and moisture. 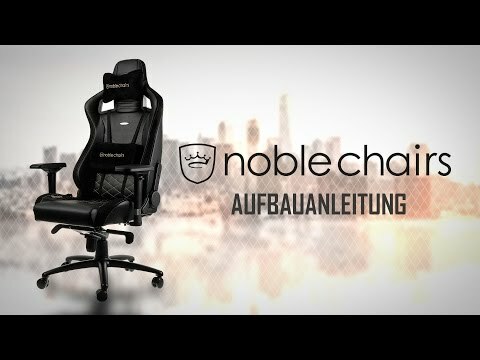 What Materials Are noblechairs Made From? Where Can I Test Out noblechairs Products Before I Buy? There are two options to try before you buy with noblechairs. The first is to visit our store in Berlin, Germany. The address for our Classic Remise based flagship store can be found below. The second is to keep up to date with our Social Media pages and find out when noblechairs is attending an event or expo. How Do I Choose Which Chair Is Right For Me? If you’d like to ask in-depth questions on which chair will fit you better according to your specific needs, either visit the flagship store for face to face consultation, or send us a message with your inquiries through our contact form.